When the anomeric hydroxyl group of one monosaccharide is bound glycosidically with one of the OH groups of another, a disaccharide is formed. As in all glycosides, the glycosidic bond does not allow mutarotation. Since this type of bond is formed stereospecifically by enzymes in natural disaccharides, they are only found in one of the possible configurations (α or β). The common examples of disaccharides are sucrose, lactose, and maltose. Sucrose is the common sugar of commerce and kitchen (hence, also called `household’ sugar) and is widely distributed in all photosynthetic plants. Sucrose is a white crystalline solid, soluble in water and with a melting point 180°C. When heated above its melting point, it forms a brown substance known as caramel. Concentrated sulfuric acid chars sucrose, the product being almost pure carbon. It is dextrorotatory and has a specific rotation of + 66.7°. It is by far the sweetest of the 3 common disaccharides (sucrose, lactose, maltose). It is also sweeter than glucose. It crystallizes in colourless crystals. It can be seen from the formula of sucrose that both the carbonyl groups (marked by an asterisk) are involved in the formation of glycosidic bond. Consequently, sucrose contains no active group and, therefore, does not exhibit those properties which depend upon the presence of this group. Obviously, sucrose does not exhibit mutarotation and is not a reducing sugar. It also does not form an osazone or an oxime. 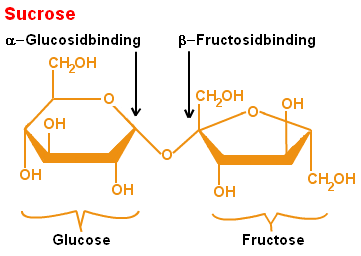 Upon hydrolysis, sucrose yields equimolar mixture of glucose and fructose which is often called invert sugar. Saccharin: Saccharin is the first artificial sweetener which was discovered accidentally by Constantine Fahlberg in 1879. It is the most-widely used artificial sweeteners. It has a molecular formula C6H4SO2 CONH, and its chemical structure is different from that of a carbohydrate. It possesses no OH group but rather a sulfonamide. It is manufactured from toluene, C6H5.CH3. Saccharin is a white, crystalline, sparingly soluble solid with a m.p. 227 °C. It is heat-stable and is 400 times sweeter than sucrose by weight in aqueous solutions. The disaccharide lactose, which yields D-galactose and D-glucose on hydrolysis, occurs naturally in milk. The anomeric carbon of the glucose residue is available for oxidation, and thus lactose is a reducing disaccharide. Lactose is solely of animal origin and is found in the milk of mammals. Human milk contains about 6-8 % (and 0.3% of higher oligosaccharides) ; cows’ milk, about 4.8%; hence, mother’s milk is about 1.5 times sweeter than cow’s milk. Lactose is a white, crystalline solid with a melting point 203°C (with decomposition) and is also dextrorotatory. The α- and β-forms have a specific rotation of + 90° and +35° respectively. The equilibrium mixture has a specific rotation +52.5°. It is less soluble in water and much less sweet than sucrose. The α-diastereoisomer is less soluble than the β-form. Maltose does not occur abundantly in nature. However, its occurrence has been occasionally reported. It is the major product of enzymic hydrolysis of starch. Maltose may be considered as originating by splitting out a molecule of water from the glycosidic OH group of α-D-glucose and the alcoholic OH group on carbon atom 4 of D-glucose. 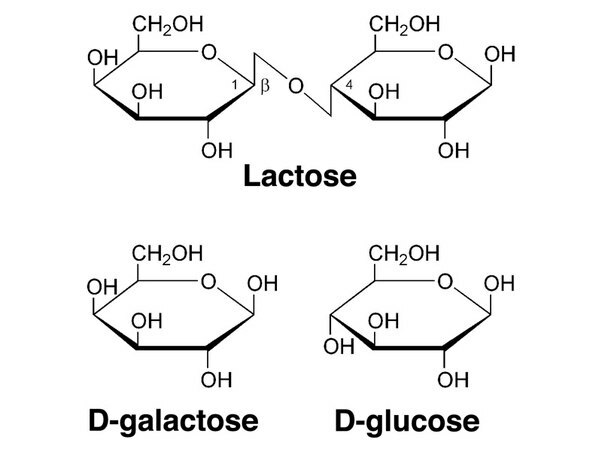 Maltose, like lactose, has one free hemiacetal group. Consequently, it too exists in 3 forms ; α, β and aldehydo. Maltose is usually found in β-form. Maltose, in solution, also exists as an equilibrium mixture of all the 3 forms. It may be noted that the linkage in both α- and β-forms of maltose is always an α-1, 4-glucoside. 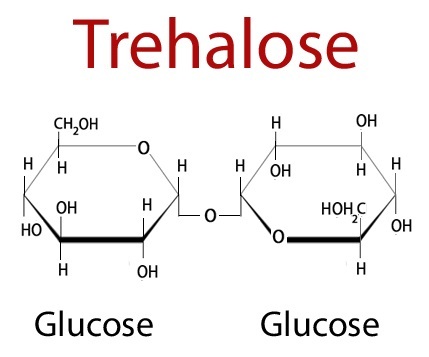 Trehalose is a major constituent of the circulating fluid (hemolymph) of insects, in which it serves as an energy storage compound. It is also found in yeasts and other fungi. Here, the two anomeric carbon atoms of the two α-D-glucose moieties connect each other. Consequently, it resembles sucrose in being a nonreducing sugar as it has no free aldehyde group. Trehalose does not form an osazone. On hydrolysis, it yields glucose. It is hydrolyzed by HCl to 2 moles of D-glucose. It is probably present in only traces in nature. However, it is apparently released during the digestion of a polysaccharide, cellulose by the cellulases of microorganisms. 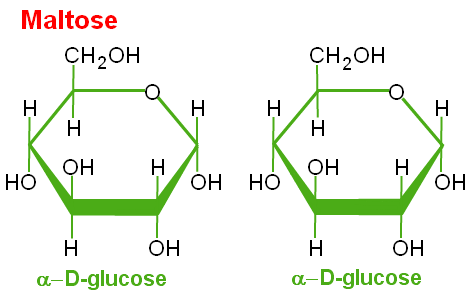 Cellobiose is identical with maltose except that the former has a β-1, 4-glucosidic linkage in contrast to the α-1, 4-glucosidic of the latter. It also exists in an equilibrium mixture of 3 forms : α, β and aldehydo. On hydrolysis, cellobiose yields glucose units only. Cellobiose is a white crystalline solid with a melting point 225 °C. It is soluble in water and is dextrorotatory. Since cellobiose contains a free hemiacetal group, it is also a reducing sugar and undergoes mutarotation in aqueous solution and forms an oxime or osazone. In fact, all the disaccharides with a free hemiacetal group (lactose, maltose, cellobiose, etc.) are reducing sugars and as such reduce cupric copper to cuprous oxide in the Fehling test and the silver ion to metallic silver in the silver mirror reaction.